It’s not for nothing that Corsica is known in France as L’île de Beauté – the beautiful island. Largely made up of stunning red granite mountains, the island is small enough to be explored in a week’s holiday, but interesting enough to provide new discoveries for many visits. The coastline is fantastically beautiful, varying from rocky coves to sandy beaches; the interior is mountainous and rugged. 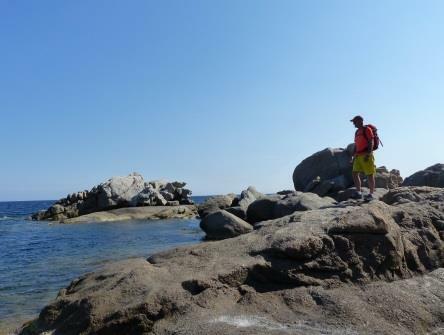 Corsica is a walker’s paradise and offers hikes at all levels. The most famous walk is the GR20, a long distance trek that follows the main mountain range that forms the backbone of the island. However, there are many other walks that are equally beautiful and less well-known. 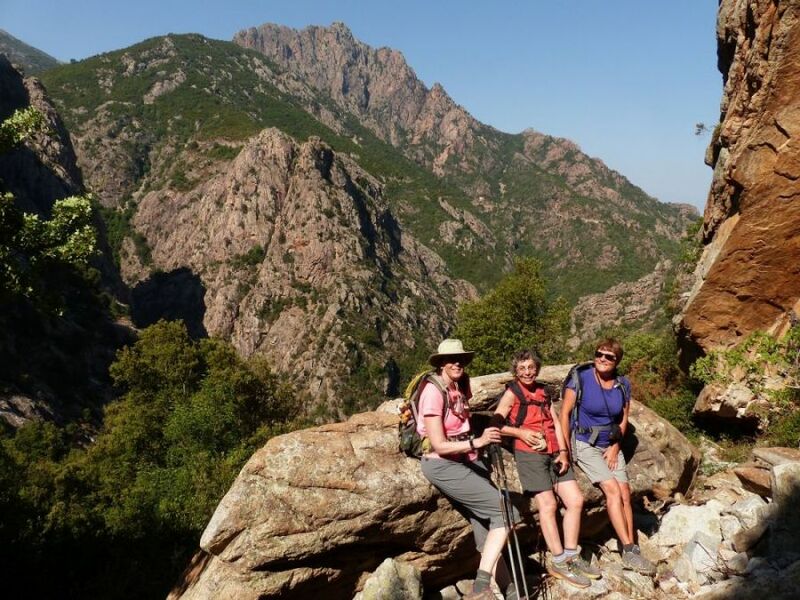 In the early summer, although the highest peaks of Corsica may still have patches of snow on their shady slopes, most of the island provides perfect walking terrain. Temperature is warm and walker-friendly, the weather sunny and best of all the flowers are out. Corsica is covered to a certain altitude in low growing vegetation, called maquis, which consists of many aromatic plants as well as several varieties of cistus and other brightly coloured flowers. To walk through this in the early summer is a fabulous experience. In June we can also expect the sea to warm enough for swimming and the rivers to be bracing! This week long holiday offers the chance to discover several of the most beautiful parts of the island. 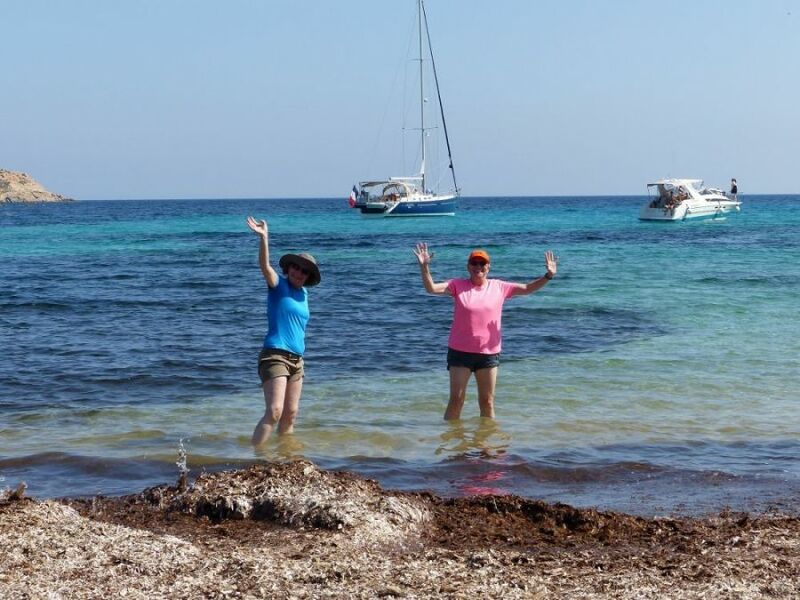 The programme consists of day walks from 3 different bases in the northern part of the island. 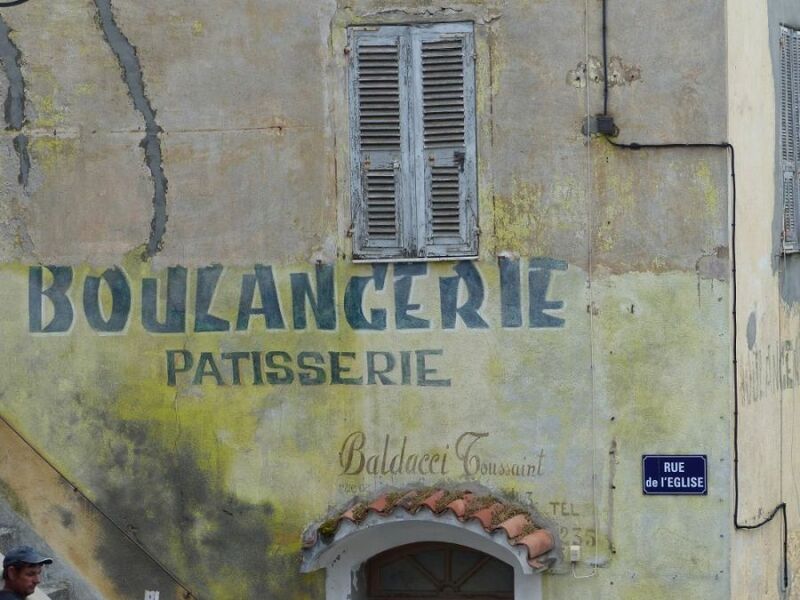 We will meet in the unique and fascinating coastal town of Calvi, on the north coast. After a couple of days walking in that area we’ll spend a night in the historic mountain town of Corte. There are some super walks along deep rocky gorges and up to high mountain lakes in this area. 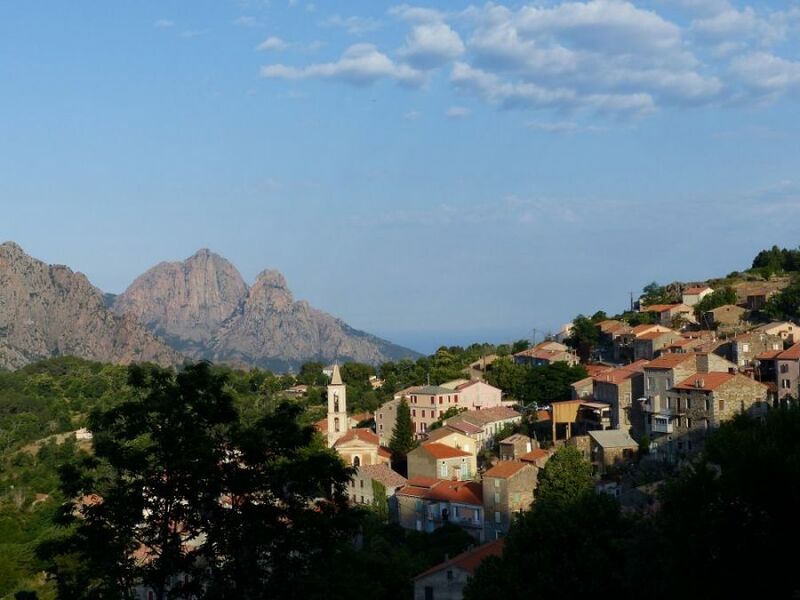 2 nights in the charming small town of Evisa, tucked away in the mountainous interior will give us some fine wild scenic hikes before returning to Calvi at the end of the week. MEETING PLACE: Calvi. Hotel details to be sent on booking. 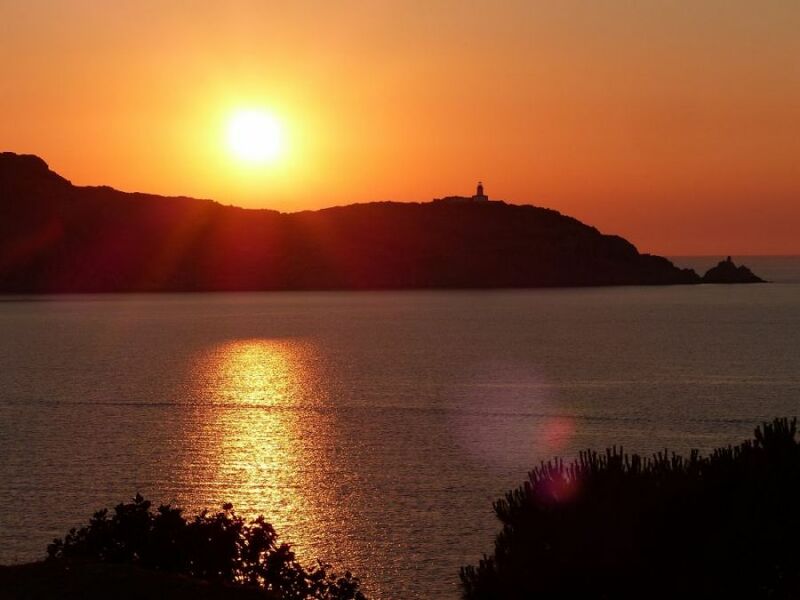 TRAVEL: The nearest and by far the most convenient airport is Calvi. . If you have to fly to Bastia or Ajaccio allow plenty of time to take the train to Calvi. (5 hours from Ajaccio, last train mid-afternoon). You can find flights with Air France from the UK, and from mainland France with Air Corsica from Marseille and Nice. ACCOMMODATION: The holiday price covers 7 nights bed and breakfast in double occupancy rooms in hotels throughout. 3 dinners are included, the rest are not as we’ll be eating out in restaurants in Calvi. Single rooms are available but there is a significant single supplement. CURRENCY: You’ll need to buy picnic foods, drinks, as well as souvenirs and postcards of course. The € is the currency that you’ll need throughout the trek. EQUIPMENT: A detailed list will be sent on booking. Requirements are basic and your rucksack should weigh no more than about 4/5kgs. All the hikes are day hikes. DIFFICULTY OF THE WALK: 2 Corsica is basically a rocky massif in the sea so as soon as you leave the coast you’re in the hills. However lots of walks on this programme take valleys and gorges. 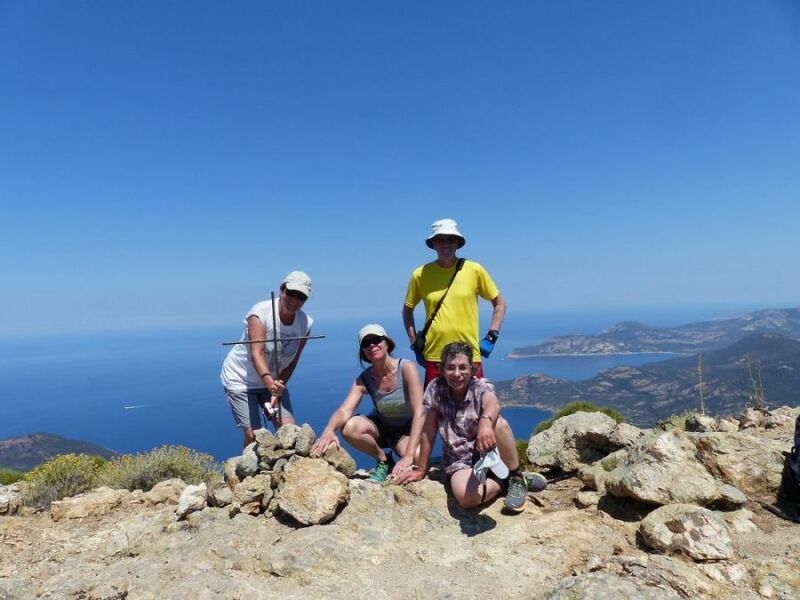 The trip is designed to be accessible and attractive to everyone who enjoys walking amongst spectacular scenery. We’ll be outside each day for up to 6/7 hours but this time is not just spent walking, there’s also plenty of time for rests, photos, lunch….and just savouring the experience. There is the option of taking a rest day during the week if desired.